There are a number of ways to get to the Old Weir Bridge – by boat, by walking, on a bicycle or a combination of some of these. 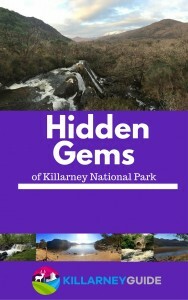 The nearest car parking spot on the main N71 Killarney to Kenmare road is a distance of about 1.5km away. From here, it is about a 20-25 minute walk to the Old Weir Bridge. The main car park at Muckross House & Gardens is approximately 5km via the Muckross and Dinis trail that skirts around Muckross Lake. The rolling paved paths are closed to motor vehicles so it makes for a lovely cycle (one way) or walk around the Muckross Peninsula. There are numerous places to stop off along the way including a secret hideaway at Rosie’s Beach. Dinis Cottage is the landmark closest to the Old Weir Bridge if you are approaching from dry land. From the Cottage, the Old Weir Bridge is only a few hundred metres via a trail that meanders through the woods and streams that surround the cottage. The start of the trail is marked by a grey sign a few hundred metres east of Dinis Cottage (on the path from the N71 car park). Beware that the start of the trail can often be flooded during the winter or after some heavy rain when the lake is high. With some adventurous spirit and a bit of off-trail navigating, you should be able to avoid the water and find the trail to make your way to the bridge.